Forty five minutes last night and an hour tonight after Keith went to bed and the windmill top is finally assembled. I’ve got brief notes as well as a photo of the vintage quilt that inspired me on the website. Finn got his haircut yesterday and today it was my turn. I usually don’t do so much running around and I was out doing more errands today but first I finished assembling my HeartStrings top. Glad to check that one off the list. The Patriotic Rail Fence is still not loaded on the longarm but that will either happen later tonight if I find some energy or tomorrow. The annual Maine HeartStrings sew-in is going on this week and I hate not being there with the group but I’m sewing along from home. This afternoon, I finished assembling the Happy Hearts top and I’ve got a small HeartStrings top loaded on the longarm and ready to quilt. Since I’m spending October in Maine, the girls are kitting up quilts for me to tie while I’m there as they assemble the tops! I know some people have tops waiting for borders but I always put my borders on at the time I’m actively working on a top … this one however wasn’t going to have a border initially. When I pieced it I was planning to quilt it on the regular sewing machine so the size was perfect without a border but now that the longarm is here, I had decided a few months ago that I would make it a little larger by adding a single framing border of 4 inches … I found a fabric that worked and then it sat out on the bench for a few months waiting for me to add the borders which finally got done today. I think this is going to be the next one quilted too, I have gray thread on the machine and while it may be hard to see in this photo, the background is a light gray fabric. My countertop is going to be installed in the half bathroom tomorrow and then there are just a couple other things to be done in there and it will functional again. I can’t wait! Not having to run upstairs every time we have to use the bathroom will be great! I couldn’t resist those sharks so I cut and pieced this Quick Strippie today. 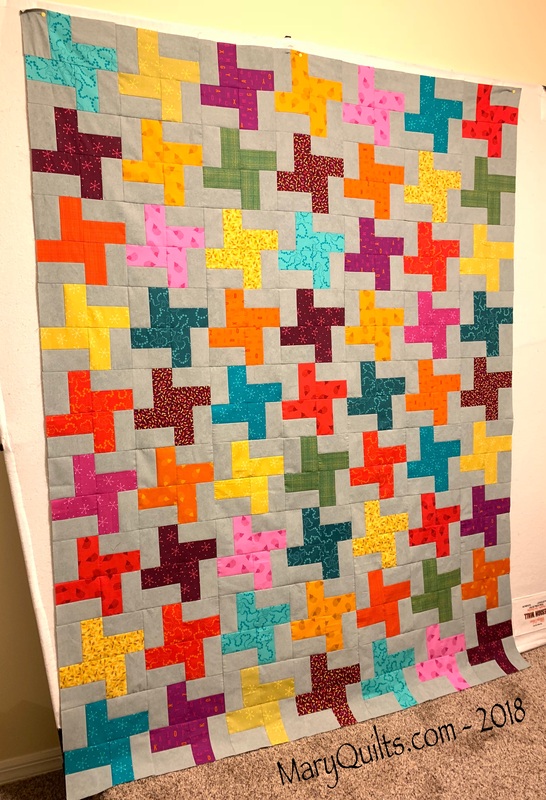 The first Happy Block quilt went together so quickly I couldn’t resist piecing a second one. I do have 24 more blocks and since each top takes 30 blocks, those WILL go to Maine to be used for group quilts. After finishing the RWB top, I decided to sew the last of the Happy Blocks for Maine. I had a stack of blocks all cut and ready to sew and since the sew-in is next month, it was time to finish them up. There were 13 of them left to finish … all trimmed now. 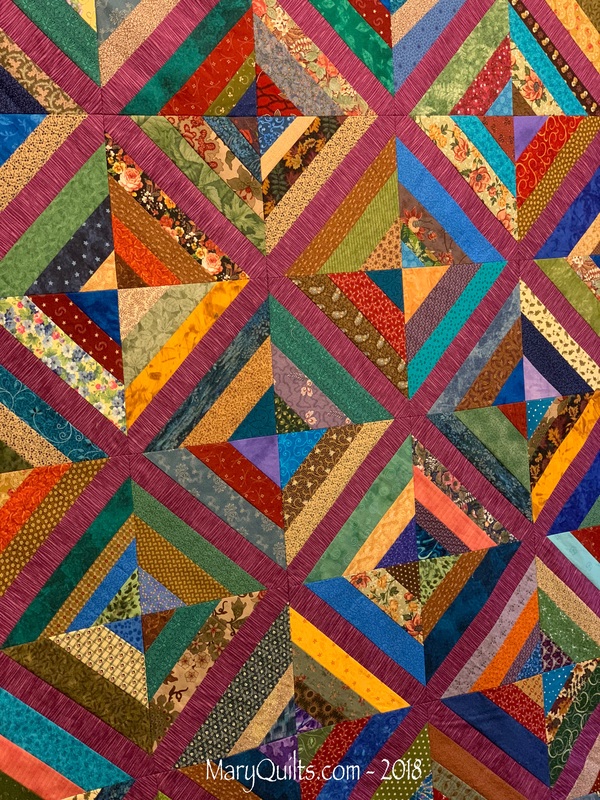 I debated back and forth over the last few months whether I was going to go ahead and piece one of the tops myself and send the rest of the blocks to Maine to be used with other donations and had made up my mind to send them all. I’m just working too slowly right?! But I couldn’t resist sorting through them and putting some up on the newly vacated design wall. And don’t be shocked but once they were up on the design wall, I started sewing them together! Fastest assembly ever! You’ll also find instructions for these blocks on the website.